Currently in the second year of his BA (Hons) studies in Digital Film & Video at LSBU, Lewis is starting to make a name for himself in the film-making world, through his film project My Genderation - which tackles society's perception of gender - and his work with UK initiatives to record modern day stories of gender warriors. Lewis says appearing on Channel 4's reality show My Transsexual Summer, gave him the confidence and the push to better his life. 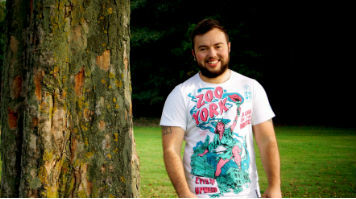 Leaving behind his hometown St Helens in Merseyside, Lewis went to pursue a career in film making in London - taking up a BA (Hons) course in Digital Film and Video at London South Bank University. Alongside his film studies, Lewis set up an independent production company - Lucky Tooth Productions - together with close friend Raphael Fox, enabling them to work on films of all genres - including comedy, documentary, music videos and animation. "One topic we wanted to tackle was the world's perception of gender, being transgender ourselves it's something we feel passionate about. So we created the film project My Genderation just under a year ago now", Lewis says. "The films explore gender variant individuals in a way that the mainstream media have never done before. It's a completely independent project with a zero budget but we put our heart and souls into each film and have met many amazing people along the way", Lewis adds. New Genderation, part of the My Genderation film project tells the story of Tayler, a 14-year-old who was born in a female body but identifies as male. "Amazingly, the BBC loved the film, and even put a filmmakers profile for us up on the site! We're hoping this will open lots of doors for us. We want the films to spread far and wide, as well as get our names out there in the filmmaking world. We're hugely grateful for everyone who has supported the films. It's an on-going project so who knows where it will take us next!" Having just started the second year of his course, Lewis has already achieved success in the film industry with My Genderation - but he has big plans for the future, and together with fellow film-maker Raphael he is working with All About Trans and On Road Media to help produce short films and provide training to transgender youth, in a UK initiative to record modern day stories of gender warriors. "I want to keep writing, filming and creating until I make an impact", Lewis says. "I want to make films that change the world and open people's eyes, but I also love to entertain and dream of having my own sitcom/comedy drama on TV. If I can win some film festivals or get a show commissioned for broadcast then I will feel I'll have 'made it'. It's all about reaching people." New Genderation can be viewed on the BBC website.